Test the movie by playing it. Close the movie preview window. Drag the movie into the Time Line Panel. A new composition is created. Click the Play button in Preview button. You may not hear the sound. Go to menu bar. Select Composition/Preview/RAM Preview. We are going to export the object in various formats. 5.2) Export as an audio. 5.3) Export as image sequence. Go to menu bar. Select File/Close Project. No need to save your project. 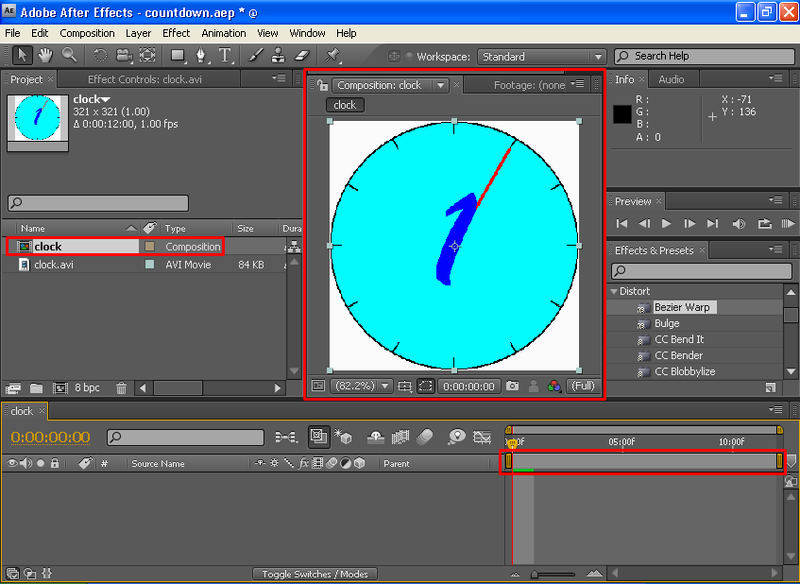 Create a new project “newcountdown” Import all the exported media in step 5 and reconstruct the clock movie. You may notice that the first two media were not correctly imported. Press CTRL-Z to undo import. Select all images and drag them to Time Line Panel. In New Composition from selection window, select clock_01.png as dimension reference. Finally add the audio file. Export your movie as QuickTime format. Download the QuickTime format here.